Another Beautiful Day in Paradise. We had clear blue skies, temperatures in the 80s and a little breeze out of the West. Bladers/Bicyclers Barbara M, Breeze, Ginnie S & Rick P, Andrew F, Roy H, Pete K & Olivia M, Rob H, Dee T, Laura P, Jim & Wilma F, Joanie C & John L, Herb E, Bruce M, Cindy S, Kim F, Wendy H and Jeff B came. Welcome all. 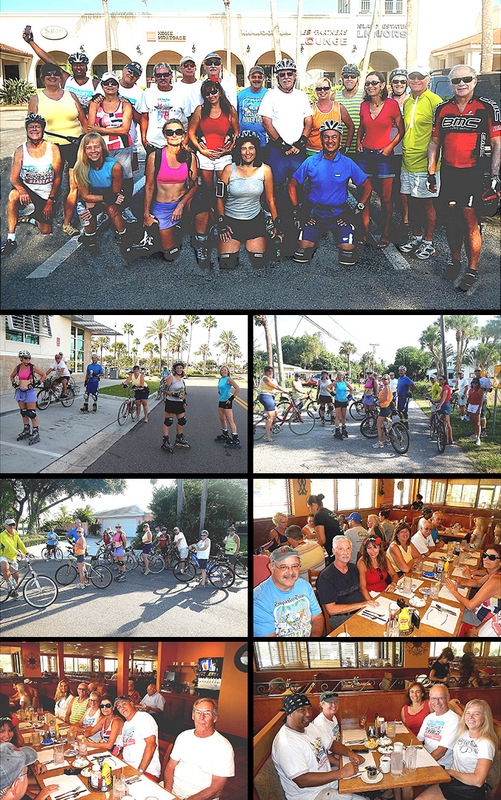 We did our usual Clearwater Beach route with a few little changes. One change kept us off a main road as long which was good. We had 6 Bladers, 15 Bicyclers and did 11 miles round trip. We Brunched at Georgie Boys as planned. We got right and seated at two tables they reserved for us. They were a little short of servers so we were forced to socialize a little longer than usual, It took us a little over an hour to get in and out. We gave Georgie Boys a 9.3.